In memory of Professor Jean Normant: a great chemist, an extraordinary man. Two complementary Pd-catalyzed protocols enabling the γ-selective intermolecular allylic amination of but-3-enoic acid derivatives are reported. These transformations can be successfully achieved via either­ a direct Pd(II)-catalyzed protocol or by way of a one-pot Pd(II)/Pd(0)-catalyzed sequence, depending on the nature of the nitrogen nucleophile used. Supporting information for this article is available online at http://dx.doi.org/10.1055/s-0035-1562453. 1 Present address: Università degli Studi dell’Insubria, Como, Italy. 17 A blank test performed as in Table 1 (entry 6), but in the absence of the nucleophile gave back the unreacted amide, which confirmed that these reaction conditions do not bring about double bond migration from B3A to B2A. Furthermore, preliminary acetoxylation experiments on Weinreb amides 1k and 1k′ gave the corresponding γ-acetoxylated product only when starting from 1k, while only the starting material was recovered when starting from 1k′ (Scheme 5). This further confirms that, under the above conditions, allylic C–H activation does not take place from the internal alkene. 20 See the Supporting Information for detailed procedures and full characterization of the pivaloxylated compounds 6a–k, and 6m. 21 We use the term ‘globally isohypsic’ as the global transformation is redox neutral, although the mechanism implies a Pd(0)/Pd(II) redox. 23 Acronyms of the ligands used: 1,2-bis(diphenylphosphino)ethane (DPPE); 1,1′-bis(diphenylphosphino)ferrocene (DPPF); 4,5-bis(diphenylphosphino)-9,9-dimethylxanthene (XANTPHOS); 2,2′-bis(diphenylphosphino)-1,1′-binaphthyl (BINAP). 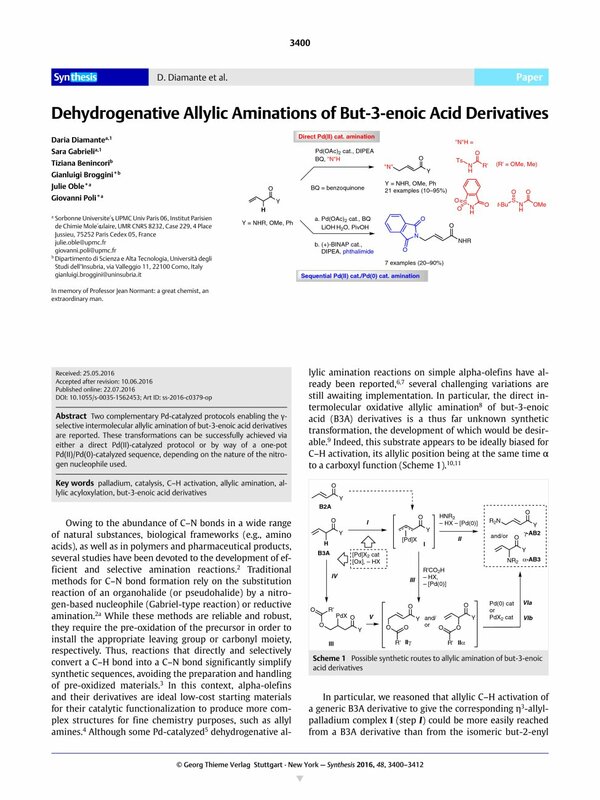 24 Given the problematic reactivity of ketone 1l in the Pd(II)-catalyzed allylic pivaloxylation, this substrate was not tested in the sequential protocol. N-Ts-carbamate A and saccharin (C) were unproductive in these sequential conditions. 32 The R-configured ligand was used for practical reasons, although its enantiopurity was obviously not needed.